Matthew Roper, “Nephi's Neighbors: Book of Mormon Peoples and Pre-Columbian Populations,” FARMS Review 15, no. 2 (2003): 91–128. 1. The “others” spoken of in this verse are most likely non-Lehite indigenous peoples. See Book of Mormon Central, “Did Interactions with ‘Others’ Influence Nephi's Selection of Isaiah?” KnoWhy 45 (March 2, 2016); “Did ‘Others’ Influence Book of Mormon Peoples?” KnoWhy 435 (May 22, 2018); “How Many Others Traveled with Lehi to the Promised Land?” KnoWhy 465 (September 6, 2018). 2. See further Book of Mormon Central, “Why Did Lehi Divide His People into Seven Tribes?” KnoWhy 319 (May 29, 2017). 3. Matthew Roper, “Swimming in the Gene Pool: Israelite Kinship Relations, Genes, and Genealogy,” FARMS Review 15, no. 2 (2003): 153, emphasis in original. 4. Roper, “Swimming in the Gene Pool,” 153. 6. Richard Dilworth Rust, “A Mission to the Lamanites,” Revelations in Context, online at www.history.lds.org; “American Indians,” Church History Topics, online at www.history.lds.org. 7. See “American Indians,” Church History Topics, online at www.history.lds.org. 8. Letter from Oliver Cowdery, 7 May 1831, online at http://www.josephsmithpapers.org/paper-summary/letter-from-oliver-cowdery-7-may-1831/1, spelling standardized. 9. For overviews of the so-called Lamanite Mission, see Max H. Parkin, “Lamanite Mission of 1830–1831,” in Encyclopedia of Mormonism, ed. 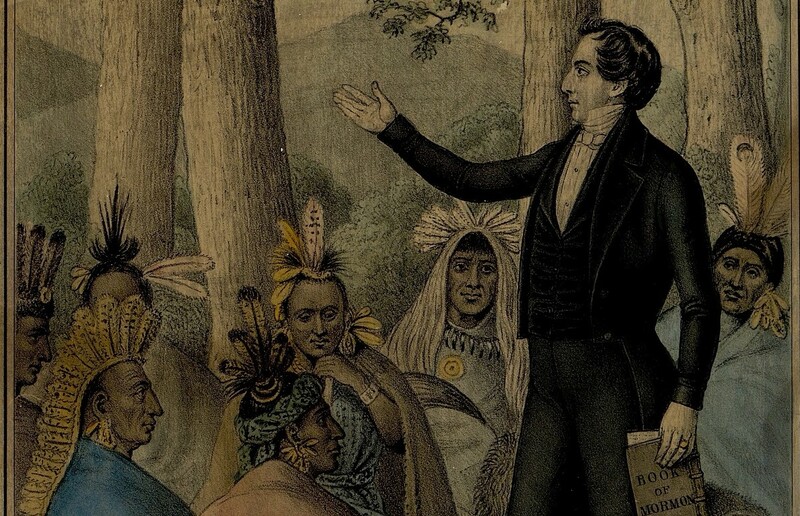 Daniel H. Ludlow (New York, NY: Macmillan, 1992), 2:802–804; Ronald W. Walker, “Seeking the ‘Remnant’: The Native American during the Joseph Smith Period,” Journal of Mormon History 19, no. 1 (1993): 1–33, esp. 5–11; Ronald E. Romig, “The Lamanite Mission,” The John Whitmer Historical Association Journal 14 (1994): 25–33; Grant Underwood, “The Mission to the Lamanites,” in Joseph: Exploring the Life and Ministry of the Prophet, ed. Susan Easton Black and Andrew C. Skinner (Salt Lake City, UT: Deseret Book, 2005), 144­–155; Marlene C. Kettley, Arnold K. Garr, and Craig K. Manscill, “Mission to the Lamanites, 1830–31,” in Mormon Thoroughfare: A History of the Church in Illinois, 1830–39 (Provo, UT: Religious Studies Center, Brigham Young University, 2006), 1–11; Saints: The Story of the Church of Jesus Christ in the Latter Days (Salt Lake City, UT: The Church of Jesus Christ of Latter-day Saints, 2018), 97–99, 115–117. 10. R. Lanier Britsch, Unto the Islands of the Sea: A History of the Latter-day Saints in the Pacific (Salt Lake City, UT: Deseret Book, 1986); Lauri F. Maffly-Kipp, “Looking West: Mormonism and the Pacific World,” Journal of Mormon History 26, no. 1 (Spring 2000): 40–63; David J. Whitaker, “Parley P. Pratt and the Pacific Mission: Mormon Publishing in ‘That Very Questionable Part of the Civilized World’,” in Mormon Scripture and the Ancient World: Studies in Honor of John L. Sorenson, ed. Davis Bitton (Provo, UT: FARMS, 1998), 51–84; A. Delbert Palmer, “Hoping to Establish a Presence: Parley P. Pratt’s 1851 Mission to Chile,” BYU Studies 38, no. 4 (1999): 115–138; Richard O. Cowan, “Beginnings in South America,” in Unto Every Nation: Gospel Light Reaches Every Land, ed. by Donald Q. Cannon and Richard O. Cowan (Salt Lake City, UT: Deseret Book, 2003), 254–271; Reid L. Neilson et al., eds., Regional Studies in Latter-day Saint Church History: The Pacific Isles (Provo and Salt Lake City, UT: Religious Studies Center and Deseret Book, 2008); Jason H. Dormady, “The Mormons in Mexico,” in Just South of Zion: The Mormons in Mexico and its Borderlands, ed. Jason H. Dormady and Jared M. Tamez (Albuquerque, NM: University of New Mexico Press, 2015), 1–22. 11. For instance, in 1851 Elder Parley P. Pratt, who had been a missionary with Oliver Cowdery during the Lamanite Mission of 1830–1831, wrote a proclamation in which he announced, “Peruvians, Mexicans, Guatemalans, descendants of every tribe and tongue of this mysterious race, your history, your gospel, your destiny is revealed. . . . [God] purposes your restoration as a righteous branch of Israel. The Book of Mormon, the record of your fathers, will soon be published among you . . . so that to say the least you may have the gospel of your forefathers, and some knowledge of their history and prophecies.” Parley P. Pratt, Proclamation! To the People of the Coasts and Islands of the Pacific; of Every Nation, Kindred, and Tongue (Sydney, Australia: C.W. Wandell, 1851), 9–10, spelling standardized. One year later Pratt similarly proclaimed, “Spanish Americans! A vast majority of you are the descendants of the ancient race of the Mexican, Peruvian, Chilean and other nations of original Americans. The origin of that entire race is now revealed . . . by the discovery and translation of their ancient records (the Book of Mormon). . . . And you, their descendants, are known in their ancient records as Lamanites, Nephites, etc.” Parley P. Pratt, Proclamation Extraordinary! To the Spanish Americans (San Francisco, CA: Monson, Haswell, 1852), 13–14, emphasis in original, spelling standardized. 12. John-Charles Duffy, “The Use of ‘Lamanite’ in Official LDS Discourse,” Journal of Mormon History 34, no. 1 (Winter 2008): 118–167, esp. 126–151. 13. Spencer W. Kimball, “To You . . . Our Kinsmen,” Improvement Era, December 1959, 938. At the dedication of the Mexico City Mexico Temple in 1983, President Gordon B. Hinckley supplicated, “Bless Thy saints in this great land and those from other lands who will use this temple. Most have in their veins the blood of Father Lehi. Thou hast kept Thine ancient promise. Many thousands ‘that walked in darkness have seen a great light.’” Gordon B. Hinckley, “Dedicatory Prayer,” Mexico City Mexico Temple, December 2, 1983, online at https://www.lds.org/temples/details/mexico-city-mexico-temple/prayer/1983-12-02. 14. See Ugo A. Perego et al., “The Initial Peopling of the Americas: A Growing Number of Founding Mitochondrial Genomes from Beringia,” Genome Research 20, no. 9 (2010); Ugo A. Perego et al., “Distinctive Paleo-Indian Migration Routes from Beringia Marked by Two Rare mtDNA Haplogroups,” Current Biology 19, no. 1 (2009): 1–8. 15. See Thomas W. Murphy, “Lamanite Genesis, Genealogy, and Genetics,” in American Apocrypha: Essays on the Book of Mormon, ed. Dan Vogel and Brent Lee Metcalf (Salt Lake City, UT: Signature Books, 2002), 47–77; Simon G. Southerton, Losing a Lost Tribe: Native Americans, DNA, and the Mormon Church (Salt Lake City, UT: Signature Books, 2004). 16. “Nothing is known about the extent of intermarriage and genetic mixing between Book of Mormon peoples or their descendants and other inhabitants of the Americas, though some mixing appears evident, even during the period covered by the book’s text. What seems clear is that the DNA of Book of Mormon peoples likely represented only a fraction of all DNA in ancient America. Finding and clearly identifying their DNA today may be asking more of the science of population genetics than it is capable of providing.” See “Book of Mormon and DNA Studies,” online at https://www.lds.org/topics/book-of-mormon-and-dna-studies?lang=eng. See further Daniel C. Peterson, ed., The Book of Mormon and DNA Research (Provo, UT: Neal A. Maxwell Institute for Religious Scholarship, 2008); Book of Mormon Central, “Why Hasn’t Lehi’s DNA Been Found?” KnoWhy 280 (2017). 17. Roper, “Swimming in the Gene Pool,” 159–163; Brian D. Stubbs, “Elusive Israel and the Numerical Dynamics of Population Mixing,” FARMS Review 15, no. 2 (2003): 165–182; D. Jeffrey Meldrum and Trent D. Stephens, “Who Are the Children of Lehi?” Journal of Book of Mormon Studies 12, no. 1 (2003): 38–51, 116; Who Are the Children of Lehi? DNA and the Book of Mormon (Salt Lake City, UT: Greg Kofford Books, 2007), esp. 85–91; Smith, “Often in Error, Seldom in Doubt: Rod Meldrum and Book of Mormon DNA,” FARMS Review 22, no. 1 (2010): 86–88; Jayne E. Ekins and Ugo A. Perego, “Is Decrypting the Genetic Legacy of America’s Indigenous Populations Key to the Historicity of the Book of Mormon?” Interpreter: A Journal of Mormon Scripture 12 (2014): 273. 18. See “Lamanite Identity,” Church History Topics, online at www.history.lds.org. 19. John L. Sorenson, “When Lehi’s Party Arrived in the Land, Did They Find Others There?” Journal of Book of Mormon Studies 1, no. 1 (1992): 1–34; Matthew Roper, “Nephi's Neighbors: Book of Mormon Peoples and Pre-Columbian Populations,” FARMS Review 15, no. 2 (2003): 91–128. 20. Duffy, “The Use of ‘Lamanite’ in Official LDS Discourse,” 118–167. 21. See “Book of Mormon and DNA Studies,” which cautions, “Much as critics and defenders of the Book of Mormon would like to use DNA studies to support their views, the evidence is simply inconclusive.” See further Matthew Roper, “Losing the Remnant: The New Exclusivist ‘Movement’ and the Book of Mormon,” FARMS Review 22, no. 2 (2010): 87–124; Ugo A. Perego, “The Book of Mormon and the Origin of Native Americans from a Maternally Inherited DNA Standpoint,” in No Weapon Shall Prosper: New Light on Sensitive Issues, ed. Robert L. Millet (Provo, UT: Religious Studies Center, Brigham Young University, 2011), 171–217. 22. See “Lamanite Identity,” Church History Topics, online at www.history.lds.org. 23. Russell M. Nelson, “The Gathering of Scattered Israel,” Ensign, November 2006, 79–81.